It's time for Rose to finally have an adventure on a planet other than earth and the Doctor is just the Gallifreyan to take her. When the Doctor and Rose land on Justicia (yes, that's really what Cole named it) Rose is entranced by a beautiful flower growing in the desolate landscape. Before they can contemplate the stark beauty for any length of time, they come across humans building replicas of the Great Pyramids in Egypt, complete with overseers who have vicious whips. It's not long before the Doctor and Rose are noticed and despite fighting to get back to the TARDIS are captured and taken to different prisons. The Doctor and Rose had the misfortune to land on a penal colony without permission and that carries a hefty sentence. Rose and The Doctor immediately begin to work on a way to reunite but it's not long before they realise that something is not right with the prison. The sound of copious farts and belches and a bright blue light hint that the prison may not be in human control after all. 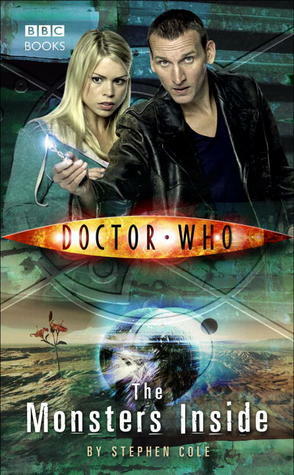 As you can see from the cover, The Monsters Inside is an adventure story staring the 9th Doctor and his companion Rose. You're going to have be patient with me while I fanpoodle for a moment because I simply loved The Monsters Inside, despite the fact that the antagonists were the puerile and disgusting Raxacoricofallapatorian (try saying that three times quickly). It easily could have been an episode of NuWho because Cole managed to capture the personalities of the Doctor and Rose perfectly. Every time the Doctor gave one his larger than life smiles or snarked, I pictured Eccleston. Rose is characterised as plucky, brave and smart. For much of the story, Rose and The Doctor are separated so the book changes POV several times. As much as I love seeing The Doctor and Rose together, the separation highlighted their closeness because the both of them were so desperate to get back to each other no matter what. Rose didn't sit around like a helpless damsel waiting for the Doctor to find her ans she never doubted they would be reunited. The Doctor's absence gave Rose the chance to step into the roll expert as she led some her fellow prisoners and a guard out of danger. Rose even proved that she has been listening to all of the technical jargon she has learned in her travels with The Doctor as she explained the mechanics of the situation to her fellow prisoners. While being alone worked well for Rose, it didn't work quite as well for The Doctor. Fans of the series know that the companions serve as a foil for the Doctor. Because The Doctor was separated from Rose, we were treated to his inner monologue. That took away some of the mystery for me. As a viewer, we are meant to know the Doctor is up to something but we aren't really supposed to know what exactly. That said, I do believe the revelation of the Doctors thoughts was thoroughly tempered by the great characterisation. The 9th Doctor can easily be described as the PTSD angry Doctor. He will do what he has to do but he is always looking for the redemption of those he faces. In the case of (channeling River Song and warning, "spoilers") the Blathereen, though they plan to kill millions, and breed humans as a captive workforce, The Doctor is willing to allow them to live. It's only when they insist on their murderous plans that The Doctor is forced to act. He begs them to stop and finally warns them to stop but in the end, when the Blathereen are not persuaded, the annihilation is near total. In the aftermath of the Blathereen destruction, The Doctor's pain and grief at what he was forced to do is absolutely palpable. As he stands in at the funeral pyre of the leader of the Blathereens, it is easy to picture him remembering the last massive burning he saw - The Fall of Gallifrey. It's Rose who pulls The Doctor aside and assures him that he had no choice and that the decision he made was the lesser of two evils. The Doctor's self doubt is writ large across the page and it's easy to see that it's Rose who keeps him whole and moving forward. The Monsters Inside is set inside a penal colony for profit. I found some of the interactions in prison to simply be stereotypical and boring; however, the larger point about prison corruption came through loud and clear. Prisoners are made to labour in horrible conditions and fed gruel. Many of them were serving extremely long sentences for the smallest of crimes and there was no attempt at rehabilitation. Though The Monsters Inside is a Doctor Who novel, it's quite clear on it's moral message regarding the many issues which come with mass incarceration and prisons for profit. Cole particularly made a salient point about humanity just wanting to lock prisoners away from society and forget about them. I know that was a bit of a long fanpoodle but I really do love The Monsters Inside. I suppose if we really must, we'll talk about the negative. Unfortunately, The Monsters Inside is not very inclusive at all. There are no LGBT characters whatsoever. There's no reason for this that I can see. When it comes to POC, the inclusion is minimal to say the least and there's no real cultural characterisation to speak of. All of this is typical for the Whoverse but it is so disappointing given that The Monsters Inside is such an excellent story. The Monsters Inside could easily have been a 9th Doctor episode and in fact, I think it would have translated even better to a visual medium because of the quick pace and the separation between the Doctor and Rose. I read this book in one sitting because I simply could not put it down. Cole managed to capture the essence of who Rose and the 9th Doctor and I for one could not get enough.